"41HS3, Extra-35" by Timothy K. Perttula and Robert Z. Selden Jr.
DECORATION (INCLUDING MOTIF AND ELEMENTS WHEN APPARENT): The rim panel has 12 sets of engraved hooked arm elements, either open or filled with hatched lines. Poynor Engraved, var. 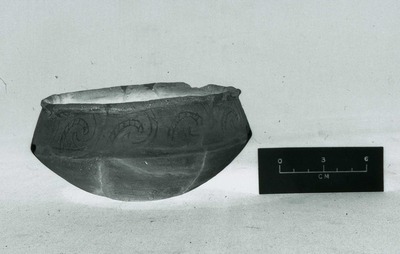 P-P’ carinated bowl (Extra-35) from the H. R. Taylor site.